There are no overnight solutions. Yet, if you can dream, anything is possible says UNP Parliamentarian for the Colombo District S. M. Marikkar. "Young Voices from Diyawanna" spoke to this parliamentarian who works hard to make his dreams come true. Marikkar went to school at Matale Rahula College and then started his career at MTV Maharaja Group. From an executive, he became a chief executive officer and finally an MBC board director. During his tenure in MBC, he won the most prestigious award in the company, 'Executive of the Year.' For many years, he headed Sirasa FM radio station, a leading channel in the country. Afterwards he entered politics and contested from the UNP for the Western Province, Colombo and became the first in the provincial council election from the UNP list from the entire Western Province. Then he took over as a UNP organizer for Kolonnawa. "Prime Minister Ranil Wickremesinghe invited me to politics. I never thought I would enter politics. The corruption during the Rajapaksa regime made me enter politics. I thought the Western Provincial Council elections would be the turning point to change the Rajapaksa regime. So I told the Prime Minister that I would contest from the UNP. 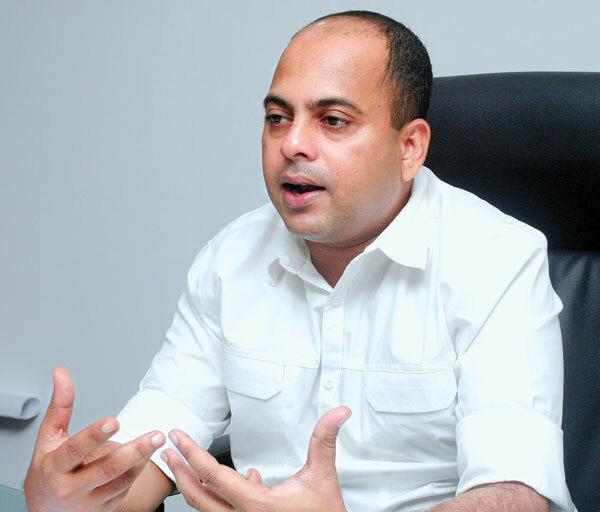 During the parliamentary election I got 92,526 votes from Colombo district and secured my place," said Marikkar. As an organizer, he is second to none. This has led to his rise in media and politics. "I am a very committed person. A target-oriented person. If I want to achieve a target, I will first prepare a plan. Sirasa FM was the number four channel and I made it number one. I maintained the number one position for many years and we won many awards such as the Slim Nielsen Peoples Awards as a popular radio channel continuously for seven years. It was all about the commitment. When I entered politics, I became number one in the Provincial Council. Then my leader handed me the Kolonnawa electorate. So it was all about commitment. I believe in commitment," stated Marikkar. There are no overnight solutions, but the target is there. Marikkar intends on doing his best. "During the Rajapaksa regime, we have seen what they have done. We have promised a real change. For that my contribution is there to the maximum, especially when it comes to stopping corruption, implementing good governance with free and fair elections and media freedom. People should have a country to live in without fear. There must also be an economic growth whilst looking into the issue of unemployment of youth and giving job opportunities. If you take Colombo, many people are living in the shanties and we have to look into that. So basically all this should happen within the democratic framework. After we elected Maithripala Sirisena as the President, we can see that there is democracy and no more white vans. Media freedom is there. You can't do everything overnight. My duty is to give my fullest support to the development of the country," pointed out Marikkar. Kolonnawa is the goal and it is no easy task. "In my profession when I was working in the private sector, I have achieved to the maximum. Nowadays my dream is to develop Kolonnawa. There are many issues such as drug issues, garbage issues, unemployment, education, sports, cultural and arts. I can't do everything overnight. I have taken the necessary steps for my plans to change Kolonnawa and uplift the people's livelihoods and lifestyles," maintains Marikkar. "Life is all about challenges. You have to take challenges in a positive way. It motivates you to achieve your target and give more commitment. Don't wait until things come to you. Do your best to achieve your targets and you will achieve it," stressed Marikkar. "We must understand that Sri Lanka is a country which has a certain cultural background. But this is not a barrier. Some people have taken culture as a barrier. I do not take culture as a barrier. You need to go with the culture. Whether you like it or not, technology has come up in this world. So this has changed our lifestyles. Sometimes I think this has made us forget our values. First we must have a knowledge and idea of our culture. When it comes to drugs, as a government we need to take necessary action to strengthen law and order. It is important to have rehabilitation centres. When it comes to the drug issue, it is very sensitive for me in Kolonnawa. If you strengthen law and order, the distribution link will break. So then comes in the rehabilitation programs. Who are most of the drug addicts? Mostly unemployed and poor people. You have to develop education and uplift lifestyles. You need to develop the economy," argued Marikkar. The formula for fear is confidence. If you are confident, people feel confident around you. "You have to have a dream about your life. You have to have a dream about what you are doing. If you have a dream, you will have a plan. If you have a plan you will have commitment. If you have commitment you will achieve," explained Marikkar. In some ways, suicide is a permanent solution for a temporary problem. "This is basically because of mental harassment. So this comes in many forms - sexual harassment, economical causes and a variety of other reasons. If our education system is excellent and people are well aware of society, if they are educated and if they are willing to face the challenges, this won't happen. If you have a problem you must be mentally strong enough to find the solution rather than trying to escape from the problem. If you try and escape then that is when you commit suicide," clarified Marikkar. If government universities cannot produce the necessary amount of doctors then what can you do? But you cannot open medical colleges nowadays like the nurseries and international schools. So under the supervision of proper authorities, up to a certain level, with the requirement of the country you should allow these Medical Colleges. With the changing world we need to make provision for what could come into Sri Lanka such as the high school shootings in the West. "Our country is now a middle income level country, so we are growing fast. The technology is coming very fast to Sri Lanka. If we are growing fast with technology, relevant authorities should seriously think about all these issues which we can expect to come into the country. In order to safeguard the country our authorities must be ready," he said. So you have to be a moderate thinker. But if you do not have values how can someone else have value for your life? People must have freedom. But if a kid has unlimited freedom then what will happen? And if you block him completely then what will happen? So you have to be moderate, warned Marikkar. "Again I must point out that you cannot come up with solutions overnight. During the previous government there was no proper law and order. When there is no law and order, it is natural that crime will rise. Society will not be disciplined. You need discipline in your life. So the same thing can be applied to society," asserts Marikkar. "I mostly listen to Sinhalese songs of Nanda Malini, Victor Ratnayake as well as young singers such as Bathiya and Santhush. I lived with songs when I was heading radio stations. I also like to read books about history, politics and arts." "I admire two leaders. I admire Gamini Dissanayake and Prime Minister Ranil Wickremesinghe. Gamini Dissanayake always took on challenges. Prime Minister Wickremesinghe is a brave leader. I like his patience."